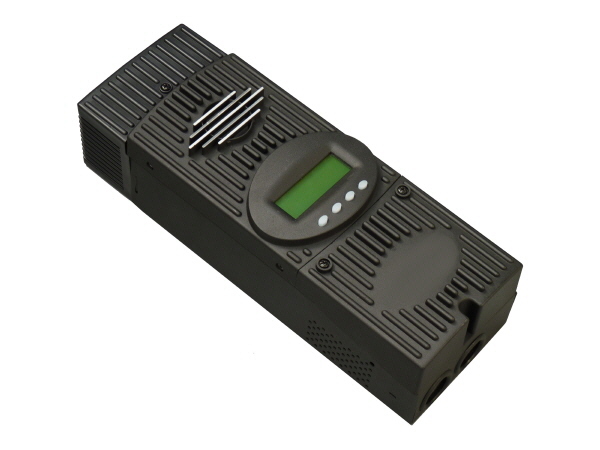 The FLEXmax 80 is the latest innovation in Maximum Power Point Tracking (MPPT) charge controllers. The FLEXmax 80’s innovative MPPT algorithm is both continuous and active, increasing your renewable energy yield up to 30%. Thanks to enhanced cooling, the FLEXmax 80 can operate at its full 80 amp maximum current rating in ambient temperatures as high as 104°F (40°C). The FLEXmax 80 supports for a wide range of nominal battery voltages and the ability to step-down a high voltage solar array to recharge a low voltage battery. A built-in backlit display shows status information at the touch of a button. Enhanced network communications allow the FLEXmax 80 to be remotely programmed via the optional MATE system display and controller.